• Excellent software/hardware/system integration was shown for its technology. It uses cloud big data analysis and smart central control system and integrated with media playback, shopping and fan interactions etc. to create a smart stadium system. • The smart stadium provides innovative business modes; not only did it increase the satisfaction level of fans to attract more audiences, but it also uses diverse advertisements to promote and sponsor enterprieses, increasing the business profit of the ball team and venue operators. 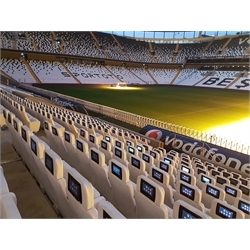 • It was successfully promoted to the Vodefone Park football field in Turkey. This park not only will host the 2019 UEFA Super Cup. It was also awarded the Project of the Year Award by the Stadium Business Design & Development Summit in 2017. • An innovative solution with world-leading technology provides VIP-class game watching experience and new business models for venue operators. • With the smart Central Console & Cloud System, sport teams can get the most out of FUNTORO solution with minimum human resource. • FUNTORO Cloud collects record and analyzes the big data of fans behavior, which give venue operators an insight of fan's preference and adjust their strategies accordingly.